Snotty Nose: How Contagious Is Ignorance in Florida’s 2nd Judicial Circuit? 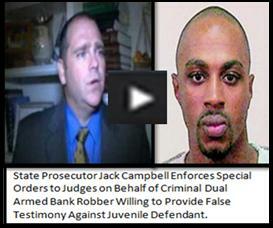 Assistant State Attorney Emmett “Jack” Campbell is the perfect example of a SNOTTY-NOSE BULLY! As stated before, he has the characteristics of a CHILD MOLESTER! He is a PREDATOR! He preys on weak people with low self-esteem; while he makes others believe that he has power—when the truth is—if the LAWS of the Land were being exercised and PROPER PROTOCOL was being followed in and out of the courtroom, he would have NO POWER. So really, he has NO POWER. PEOPLE WHO BREAK LAWS HAVE NO POWER! So what Emmett “Jack” Campbell has done, being the SNOTTY-NOSE BULLY that he is, has led all of those who have long supported his EVIL doings, down a disastrous path with him because he doesn’t want to be the only one to bare shameful, dishonest, and immoral practices. He has deceived those unsuspecting newcomers—who are “directly” unfamiliar with his predatory actions. However, at the end of the day, all of those will fall because of their own STUPIDITY! Neither the Laws of the Land nor the rules set by the Florida Supreme Court, acknowledge ignorance as a defense. Author MAUL10Posted on November 18, 2013 Leave a comment on Snotty Nose: How Contagious Is Ignorance in Florida’s 2nd Judicial Circuit? BROOKSVILLE — After nearly four hours of questions at the Hernando County Sheriff’s Office, Robert Jardin decided that he was through talking with detectives. He told them he was ready to go home. But the detectives told him to sit down. Then they told him they had to go over the results of his voice stress analysis test. Finally, they told him he was going to be charged with a crime. It was at this point, Circuit Judge Jack Springstead said, that detectives should have advised Jardin of his Miranda rights. Because they failed to do so, the judge has suppressed statements Jardin made in reference to the October 2006 stabbing deaths of an elderly Masaryktown couple. “The state detective should have known that discussions with (Jardin) regarding inconsistencies in his CVSA exam results could have elicited an incriminating response from (Jardin),” Springstead wrote in a ruling that was filed Friday. Jardin faces two counts of first-degree murder, armed burglary and grand theft for his role in the stabbing deaths of Patrick and Evelyn DePalma in their home in rural south Hernando County. His trial is set to start on Aug. 23. If convicted, Jardin could be sentenced to death. Assistant State Attorney Pete Magrino, the county’s chief homicide prosecutor, said he was disappointed with the ruling but wasn’t surprised given Springstead’s line of questioning during Wednesday’s hearing over the motion. The issue before Springstead was whether Jardin was properly informed of his Miranda rights before making statements to detectives during an interview at the Sheriff’s Office in July 2008. Jardin went to the office after being summoned there by deputies who told him they were looking into a bar fight. He initially signed a Miranda waiver form and agreed to speak with detectives in a “non-custodial” interview, according to the motion. As the interview went on, the questioning shifted to the murder case. According to court documents, Jardin said he was at the home the night of the murders and saw the couple lying dead in a hallway. Detective Phil Lakin then attempted to delay Jardin, telling him they were still looking over his test results. In his ruling, Springstead notes that the interview had “shifted from a consensual, non-custodial interaction into a custodial interrogation” and authorities should have again advised Jardin of his Miranda rights. “This is exactly the type of compelling pressures that undermine one’s willpower that the Miranda doctrine was designed to prevent,” Springstead wrote in his ruling. Unfortunately, the Leon County Sheriff’s Office and Florida’s 2nd District State Attorney’s Office does not mind violating citizens Florida and U.S. Constitutional Rights nor do they mind wasting taxpayers’ dollars. Unbeknowest to DeShon and his mother, Leon County Sheriff’s detectives had already pre-determined that DeShon was the murderer of the two victims long before they blindly walked into their office to give their statements. When DeShon agreed to speak with detectives in a “non-custodial” interview, his mother didn’t object until Reserve Deputy Don Odham would not allow her to get on the elevator—blocking her every move. DeShon’s mother invoked DeShon’s Miranda Rights and told them that she wanted an attorney for her son, who was a minor. Instead of adhering to DeShon’s mother’s request—detectives completely ignored her; deliberately kept DeShon and his mother at the Leon County Sheriff’s Office—locked them into an interview room, and then seven hours later (2 a.m. January 29th)—stated that DeShon was going to be placed under arrest, refused to tell his mother what he was being charged with—and then Reserve Deputy Don Odham, who’d been using racist vulgar, abruptly kicked Deshon’s mother out of the Leon County Sheriff’s Office—escorting her from upstairs and out of the doors—using racist vulgar and making disparaging statements the entire time. It wasn’t until around 5 a.m. as to when DeShon’s mother received a phone call from the Juvenile Assessment Center asking her to come pick DeShon up. DeShon had been charged with cultivation of marijuana and possession of drug paraphernalia. It was later learned that during the time when DeShon and his mother were at the Leon County Sheriff’s Office, detectives had used false information to obtain a search warrant for 21-year-old Trentin Ross’ one-bedroom apartment. Trentin Ross and DeShon were co-workers. DeShon had been temporarily living with Mr. Ross. During the execution of the search warrant, detectives located 5 pots of soil with marijuana stems sprouting from them in Mr. Ross’ bedroom closet. Both Mr. Ross and Mr. Thomas was charged, despite Mr. Ross admitting to caring for the plants—never implementing Mr. Thomas as the care provider or the one who brought the plants into his residence. It would be the cultivation of marijuana and possession of drug paraphernalia charges that would hang over Mr. Ross’ head until he testified at DeShon’s recent trial in October 2013. Mr. Ross, who waited 11 days, despite numerous interviews with Lt. Baxter, reportedly told Reserve Deputy Don Odham that he knowingly knew that 17-year-old DeShon had in his possession 3 guns before driving DeShon to the victims’ residence during the early morning hours on January 27, 2011 and from afar—basically witnessed a double murder and then drove DeShon to dispose of a gun in a dumpster that was no less than a mile away from the victims residence. Mr. Ross was not charged in relation to the murders. The gun used in the murders was not recovered. The Leon County Sheriff, the 2nd District State Attorney’s Office and all of those representing the 2nd Judicial Circuit MUST abide by ALL State and Federal Laws accordingly. And for those who choose not to–MUST be held accountable. Why Florida 2nd Judicial Circuit Court Judge Throw The Dog “BIG” Bones? After their meeting, in the days that followed, Mr. Cummings aggressively solicited DeShon’s mother to hire him. On March 9, 2011 a little over a month since 17-year-old DeShon Thomas had been charged with Two Counts of 1st Degree Murder, DeShon had no attorney; on the same day the State Attorney’s Office announced that in addition to the murder charges, they were charging DeShon with Possession of a Firearm by a Juvenile Delinquent. DeShon, who had already pled Not Guilty to the murder charges—didn’t understand why he was being charged with Possession of a Firearm by a Juvenile Delinquent. DeShon and his mother knew that Leon County Sheriff’s Office didn’t have the murder weapon—so they too were wondering why over 30 days after his arrest was he receiving this new charge. With no attorney to help them understand what was going on with the past—now current—and future process of what’s to come—not only were things becoming very scary for DeShon and his mother—they didn’t know how much longer was DeShon going to be sitting in jail without an attorney. Low and behold, that very day (March 9, 2011), Mr. Cummings called DeShon’s mother. This time Mr. Cummings was no longer asking DeShon’s mother about hiring him—he was telling DeShon’s mother that she needs to hire him. Mr. Cummings basically stated the incompetence of the judicial system as the reason for the delay as to why DeShon hadn’t been assigned an attorney. DeShon’s mother was confused by the whole process, including the extreme delay of an attorney being assigned to DeShon’s case—she agreed to hire Mr. Cummings. Mr. Cummings told DeShon’s mother that he would email her the Contract for Service. They agreed to meet on March 12, 2011 to sign it. The next day (March 10, 2011), Mr. Cummings emailed DeShon’s mother a copy of the Contract. (**click link**) OM 3 10 11 On March 9, 10, and 11 DeShon and his mother contacted both the Leon County Clerk of Courts and the Criminal Conflict and Civil Regional Counsel’s Office seeking out his attorney—neither office had any information. In late March 2013, DeShon’s mother found out that Mr. Cummings was in trial representing Mr. Elijah James. Mr. James, who was convicted in February 2011 in Georgia in the 2010 arson case where he set his missing girlfriend’s car on fire, was extradited to Tallahassee to stand trial for his girlfriend’s murder—although her body had not been found. State Prosecutor Jack Campbell was set to convict Mr. James—Circuit Judge James Hankinson presided over the case. On April 2, 2013 after having been denied his motion to withdraw from DeShon’s case by Judge Hankinson, Daren Shippy appeared in court for DeShon’s case management hearing. While the hearing took place in Judge Hankinson’s courtroom, Judge Hankinson was in another courtroom presiding over Mr. James’ case. As Mr. Shippy walked into the courtroom, walking alongside of him was Mr. Cummings. The two of them were talking—Mr. Cummings looked to be stroking Mr. Shippy as if he was a pet weasel. Mr. Cummings then walked over and shook the hand of a deputy. Afterwards, he sat in the front row. DeShon’s case was the first to be called. At the conclusion of the brief discussion, Mr. Cummings thanked Mr. Shippy and proceeded to leave the courtroom (more than likely to go back to represent Mr. James). The majority of Tallahassee residence cannot afford the high cost of legal representation. Because of that—there are several attorneys who have to close their private practice and work for either the Public Defender’s Office or the Office of Criminal Conflict and Civil Regional Counsel’s Office—if not directly—then indirectly as a conflict-free attorney. An attorney in private practice working as a conflict-free attorney may seem to have to show some form of allegiance to the judges in which gives him/her cases to which there’s longevity and a guaranteed steady paycheck in that realm. With a single client, who will come and go—who may go without paying in full—there’s no allegiance to them. Although DeShon’s mother promised Mr. Cummings that she’d pay him in full—with nearly $30,000 netting DeShon absolutely nothing—not even a Defense Witness List—then surely $50,000 was only going to end with guilty verdicts. DeShon went to trial being represented by a court-appointed attorney. After DeShon’s mother spent nearly $30,000 he had to default to the use of taxpayers’ dollars. There was one witness, Trentin Ross, that gave State Prosecutor Jack Campbell an incriminating testimony against DeShon—to which everyone knows that if there was any shred of truth to Mr. Ross’ statement, he too would be charged with something in connection with the murders. Although the jury has spoken, DeShon’s mother’s intuition about Mr. Cummings was accurate—the reason for Mr. Cummings not objecting to State Prosecutor Jack Campbell’s 4 or so Motions for Continuances was because he (Campbell) had nothing—Trentin Ross was not going to come to Tallahassee and lie for them. During the trial, Trentin Ross’ attorney, Paul Srygley, stated that he was holding out trying to work the best possible deal for his client who’d only been charged with cultivation of marijuana and possession of drug paraphernalia. So basically holding out for over 2 years… It took State Prosecutor Jack Campbell and Det. Newlin to make arrangements with an inmate in order to get Trentin Ross to believe that there was a hit out on his life–they needed him to get back to Tallahassee to testify—to LIE. (**click link**) egc 7 18 12 This email is in response to DeShon’s mother’s email which was sent out in April–this is a great example of how out of touch Mr. Cummings was with not just DeShon’s mother but also DeShon. The email also brings to the forefront that Mr. Cummings knew what State Prosecutor Jack Campbell and Trentin Ross’ attorney were up too but instead of doing what was best for his client (DeShon Thomas), Mr. Cummings and Circuit Judge Hankinson allowed them to do their “Dog and Pony” show–as Mr. Cummings continued to collect DeShon’s mother’s thousand dollar payments. It’s been said that State Prosecutor Jack Campbell, Criminal Defense Attorney Gregory Cummings and Circuit Judge James Hankinson all mostly work Tallahassee’s high-profile cases. It’s been said that 2nd District State Attorney Willie Meggs allows Jack Campbell to do whatever he feels—regardless. It seems that judges in Florida’s 2nd Judicial Circuit seem to sign off on whatever Jack Campbell puts in front of them to sign without any reservations. DeShon’s mother spoke with a few other private attorneys in Tallahassee about DeShon’s case. At the time in which she spoke with them—there was no problem for them to take on the case. Not long thereafter, neither of the attorneys was able to represent DeShon—the both attorneys (conflict-free counsels) had clients who were inmates—their clients had been associated with DeShon’s Solicitation to Commit 1st Degree Murder case. Judge James Hankinson may have been removed from presiding over DeShon’s case—but in late July 2013—he supported State Prosecutor Jack Campbell by signing the Order to prevent DeShon’s mother from visiting with DeShon. State Prosecutor Jack Campbell has not failed to get the support of many locals when it comes to his frivolous claims. One could only hope that those who support him realize what they’re getting into. Rule 4-1.3 Diligence: A lawyer’s workload must be controlled so that each matter can be handled competently. DeShon’s mother has yet to hear a response from The Florida Bar. This type of service cannot be viewed as acceptable by the Florida Supreme Court. Author MAUL10Posted on November 8, 2013 November 8, 2013 2 Comments on Why Florida 2nd Judicial Circuit Court Judge Throw The Dog “BIG” Bones? Tallahassee, FL —When DeShon Thomas’ mother returned home from his long awaited trial, there was an overnight U.S. Express Mail envelope that had been returned to her—it was one that she’d previously mailed to her son’s attorney, Regional Counsel Daren Shippy. The unopened mail had gone Unclaimed twice at the Tallahassee Post Office where the Office of Criminal Conflict and Civil Regional Counsel’s Office receives their mail. The Unclaimed Express envelope was a reminder of how every attorney placed to defend DeShon of the bogus charges against him—have been literally against properly presenting information and dodging information in a way that could clearly and completely exonerate him. Desperately doing any and everything to not hear or care about what his mother has to say—simply because they know that what she has to say makes the most sense. In March 2013 when Daren Shippy was first assigned to represent DeShon (well, actually 7 months ago considering he didn’t want the case—so officially April 2013), anyway, DeShon’s mother called Mr. Shippy to share information and to offer to pay for a private investigator to assist on the case. Also, DeShon’s mother, who previously worked in telecommunications, had contacts at a number of cell phone companies, including AT&T, Sprint and Verizon. When she received the probable cause back in February 2011 in regards of the murders—it basically stated that AT&T had provided the Leon County Sheriff’s Office with DeShon’s cell phone records, so she reached out to AT&T and obtained information about DeShon’s cell phone records. DeShon’s mother had shared this same information with Mr. Cummings—after the horrific outcome with Mr. Cummings—there was no way for DeShon’s mother to believe that Mr. Cummings would honestly handover/ relay important information over to the attorneys that replaced him. Unfortunately, Mr. Shippy never returned any of DeShon’s mother’s phone calls. This wasn’t the Office of Criminal Conflict and Civil Regional Counsel’s Office first time assigned to DeShon’s case. As a matter of fact they were assigned to his case 3 times. Jeff Lewis, Regional Counsel over District One, does not work full-time within the Tallahassee office. Not everyone is capable of working unsupervised. Often times—even those in supervisory positions need to be supervised. The underlining problem with the Office of Criminal Conflict and Civil Regional Counsel, District One was—in August 2012, after DeShon fired his private attorney Gregory Cummings—Circuit Judge James Hankinson appointed DeShon’s case back to the Public Defender’s Office. (In February 2011 the Public Defender’s Office conflicted off of the case—they were able to conflict off of the case again in September 2012.) The Office of Criminal Conflict and Civil Regional Counsel’s Office was appointed to DeShon’s case—actually—they were re-appointed to Deshon’s case. Now here is where DeShon’s mother’s suspicions of unethical practice began to expand beyond Mr. Cummings. Back in February 2011, to the knowledge of DeShon, his mother, the Leon County Clerk of Courts and the person answering the phone at the Office of Criminal Conflict and Civil Regional Counsel’s Office—there were no other attorney assigned to DeShon’s case. Back in February 2011, before the Public Defender’s Office conflicted off of DeShon’s case, they were very informative and took it upon themselves to contact DeShon’s mother to inform her of any court dates and other input concerning DeShon’s case. The Public Defender’s Office wanted to make sure that DeShon’s mother was aware of what was going on with DeShon’s case so that she could help reinforce DeShon’s understanding of the charges (DeShon was only 17-years-old at the time of his arrest). The Public Defender’s Office sincerely seemed to want the best possible outcome for DeShon. The Public Defender’s Office are the ones who set the foundation as to how a legal team should work with the defendant that they are responsible for representing—not looking to do any favors—just looking to present the facts of the case. That was not so for Circuit Judge James Hankinson and the Office of Criminal Conflict and Civil Regional Counsel’s Office. Back in February 2011, when the Office of Criminal Conflict and Civil Regional Counsel’s Office was assigned to DeShon’s case, no one made contact with DeShon or his mother. DeShon and his mother repeatedly called the Leon County Clerk of Courts and the Office of Criminal Conflict and Civil Regional Counsel’s Office nearly begging for a contact name for whoever replaced his Public Defender—to no avail. So now—fast-forward to nearly two years later (September 2012) and just imagine the shockwave that went through DeShon’s mother when she learned that DeShon was not only court appointed an attorney from the Office of Criminal Conflict and Civil Regional Counsel—where the attorney never Filed a First Appearance, which is required by all attorneys when they come on a case—and then the attorney never contacted DeShon to let him know that he had come onto the case. DeShon wasn’t in jail charged with stealing a piece of bubble gum from Circle K—this teenage boy, who was a full-time freshman college student and employee—was in jail for murdering two people—the female victim was pregnant—her toddler daughter was left in the home to fend for herself. At the time of the murders—nobody knew for sure that DeShon was the father of the deceased unborn baby. In Det. Mike Reeves report, dated January 31, 2011, there’s a statement from the female victim’s 21-year-old boyfriend–he states that he thought (because she told him) that he was the father of her unborn baby. So instead of Leon County Sheriff’s Detectives saying DeShon murdered her because he didn’t want her to have the baby—they should’ve investigated all angles—they could’ve looked at it and said maybe the boyfriend murdered her because he found out that he wasn’t the father—maybe since she was moving to Jacksonville she told him that he wasn’t the father. In March 2011, Mr. Olmstead conflicted off of the case—whereas DeShon was court-appointed a conflict-free attorney. Again, DeShon was not made aware that he’d been assigned a conflict-free attorney. It is believed that the conflict-free attorney had not been informed that he’d been assigned DeShon’s case. In regards to the murder charges, the Leon County Clerk of Courts was not made aware that DeShon had been assigned a conflict-free attorney. Sure, all of this may sound like possible episodes where communication was lacking—that’s what it may sound like. However, after the Public Defender’s Office contacted DeShon’s mother and told her that they were getting off of the case, DeShon’s mother didn’t know what to expect. Although she knew that she wasn’t going to hire a private attorney until she’d spoken with DeShon’s court-appointed attorney, she was inclined to speak to a private attorney just in case if she was going to need one. Mr. Gregory Cummings was one of the attorneys whom DeShon’s mother had spoken/met with. Before and after meeting with Mr. Cummings, DeShon’s mother told him that she was not going to hire an attorney until after she’d spoken with DeShon’s court appointed attorney. Nearly a month passed —no attorney had been named on DeShon’s case. Meanwhile, Mr. Cummings was aggressively soliciting DeShon’s mother to get her to hire him to represent her son. Each time DeShon’s mother repeated her need to wait to speak with DeShon’s court appointed attorney. When DeShon’s mother, a single parent—who took out a loan against her life insurance policy as part of a way to pay Mr. Cummings nearly $30,000 learned that two of DeShon’s previous court appointed attorneys had been withheld from her and DeShon’s knowledge… In addition, in response to the Florida Bar complaint that DeShon’s mother filed against Mr. Cummings (which fell flat), Mr. Cummings basically acknowledges Circuit Judge James Hankinson’s willingness to do whatever he (Mr. Cummings) asks of him to do. From DeShon’s mother’s point of view that means purposely withholding the information/names of the very attorneys that he (Circuit Judge Hankinson) assigned to represent him—allowing time for Mr. Cummings to harass DeShon’s mother during their most vulnerable state. So again, now that Mr. Cummings has been fired—the same attorney from February 2011—the Office of Criminal Conflict and Civil Regional Counsel’s Office is being reassigned to the case? There were only two questions that DeShon’s mother wanted to know—what happened with him back in 2011? And—what is it going to take for DeShon to get a fair and equal trial? DeShon’s mother left several messages on the attorney’s voicemail. She also mailed the attorney a few letters—no response. Six months on the case—this attorney did absolutely nothing! This attorney with the Office of Criminal Conflict and Civil Regional Counsel’s Office did absolutely nothing in regards to DeShon’s defense. Circuit Judge James Hankinson allowed this—the same as he allowed State Prosecutor Jack Campbell and Mr. Cummings to play patty-cake for nearly 16 months—he allowed this attorney to play ghost—not appearing at quite a number of DeShon’s case management hearings. In June 2013, Judge Jackie Fulford replaced Circuit Judge James Hankinson. In September 2013, two weeks before DeShon’s trial, Mr. Shippy called DeShon’s mother to inform her about DeShon’s need for clothes to wear during trial—he also asked for contact information for one of the witnesses. DeShon’s mother reminded Mr. Shippy that that was the job of a private investigator—one to get the contact information of all of the witnesses. (DeShon’s mother had offered to pay for a private investigator to assist Mr. Shippy—to no avail.) It was brought to DeShon’s mother’s attention that Mr. Shippy had called several of DeShon’s family members trying to get contact information of witnesses—to which none of them, including DeShon’s mother, had the information. During trial, Mr. Shippy called DeShon’s mother out in open court about the presence of a witness—stating that she should’ve informed him about the witnesses’ presence in the courtroom. Again, had there been a private investigator on the case—this wouldn’t have happened. If Mr. Shippy had developed an open line of communication with DeShon’s mother—this wouldn’t have happened. Fortunately, the courtroom bailiff corrected Mr. Shippy—that witness was not present in the courtroom during the time in which Mr. Shippy was crying about. Also, there were several Leon County Sheriff’s Detectives that could’ve assisted with exonerating DeShon—Mr. Shippy either didn’t have them subpoenaed to trial or when they took the stand he didn’t ask them the proper questions. For example, Mr. Shippy didn’t ask Det. Melinda McBride about what the victims’ brother and mother telling her about Sterling (the male victim) buying $400 worth of drugs with fake money shortly before the murders. Neither did Mr. Shippy ask the victims’ mother about a confrontation that her daughter, Laqecia (the female victim) had been involved in within 48 hours of her murder to which several threatening Facebook posts between Laqecia and her once bestfriend were extremely serious—her daughter owed about $350 to the bestfriend and the bestfriend’s mother. Since everybody knew that the victims were leaving to go to Jacksonville—the people that they two victims had wronged monetarily knew that if the victims left town then they weren’t going to get their money. This information was provided early on in the investigation—before DeShon’s was charged with the murders. The week of October 14, 2013 DeShon got his day in court—the verdict—after all that had been done and had not been done—was not surprising to DeShon’s mother. It’s simply —if a woman doesn’t want a man to know her level of intelligence about engine parts in fear that she may intimidate the man—then she’ll play stupid, however, from time to time, naturally, her level of intelligence will show. The same can be said about Mr. Shippy. On the fourth day of court (while DeShon was on the stand testifying on his own behalf—after he’d made State Prosecutor Jack Campbell look like a plum fool ) Judge Fulford immediately called for a long side bar—the longest ever. Afte side bar she whispered in a bailiff’s ear–next DeShon’s mother and brother (his only support team) were kicked out of the courtroom. They were told because of gesturing and whispering. While DeShon’s mother does not deny gesturing or whispering—it was not to the level to where she and her son—had to be removed from the courtroom. Besides that, Judge Fulford never gave specific rules of the courtroom other than cell phone usage—and when the victims’ family members were doing a lot of walking in and out of the courtroom. DeShon’s mother was told by another person that after they were kicked out of the courtroom, Judge Fulford explained the rules of the courtroom to others. Judge Fulford should never expect people to automatically know courtroom etiquette. It is her duty to go over the rules and what she expects of those in the courtroom before trial begins. Not wait and have a defendant’s family members removed from the courtroom in front of the jury. It’s possible that Judge Fulford may have been paying more attention to DeShon’s mother than the jurors themselves. What Judge Fulford saw DeShon’s mother doing—may have gone unnoticed by the jurors. Like everything else, being kicked out of the courtroom was something that DeShon’s mother took in stride. Looking at DeShon’s case as a whole— had DeShon’s mother and brother been allowed to be present in the courtroom for DeShon’s entire trial would’ve probably made people think that there was some shred of dignity within the Florida’s 2nd Judicial Circuit.